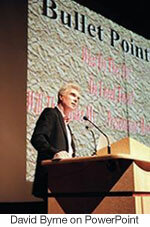 Presentation Zen: David Byrne on PowerPoint: Freedom — who needs it? "I love not having an unlimited palette. In that sense it's like a pencil. You don't expect to have other typefaces or fonts; you have fun with what's there. Freedom — who needs it?" “You can't blame it on PowerPoint. …You see it on the TV news, everything's filled with graphics and icons — it has the illusion of content but there's very little being communicated." Byrne admits that the limitations of the PowerPoint tool can lead to pretty awful stuff visually, but that it’s constraints can also lead to creative and compelling visual displays as well. Byrne published and expensive art book called Envisioning Emotional Epistemological Information in 2003 to mixed reviews. If nothing else, Byrne’s approach to using PowerPoint may help some look at the tool in new ways. I didn´t know anything about his other artistic actions, thank you, Garr. Sorry, couldn't help myself. Keep up the great work, Garr.